A couple of hundred miles South of Miami, Florida, where the Caribbean Sea, Gulf of Mexico, and the Atlantic Ocean touch, lies the island nation of Cuba. Officially the Republic of Cuba. A sovereign state since January 1959, Cuba was liberated by el Movimiento 26 de Julio (the July 26 Movement), the vanguard revolutionary organization led by Fidel Castro, accompanied by the well-known, and often quoted Argentinian physician Ernesto “Che” Guevara, which succeeded in overthrowing the dictatorship of Fulgencio Batista. Since the revolution of ’59, the island has been a constant thorn in the side of American capitalism. The exploitation of the island’s vast natural resources by American interests—sugar, tobacco, coffee, beans, rice, potatoes, and livestock—came to an abrupt end and was met with swift punishment: embargo. Yet, despite the tension of the decades that followed, the United States and Cuba continued to share one national pastime—baseball. And this shared love can be traced back to the year 1868 in Lansingburgh, New York. Enrique “Steve” Bellan, the true “father” of Cuban baseball, laced up his cleats for the first time in the United States, playing six seasons in the National Association of Base Ball Players (NABBP)—the first Latin American born to play in the U.S., before returning to Cuba and organizing its first baseball game. And as of Wednesday, December 19, the fractured relationship between these two nations was cobbled together for the sake of baseball. Major League Baseball, its players’ association (union), and the Cuban Baseball Federation reached an agreement allowing players from the island to sign big league contracts without having to defect. The agreement, under contract in South Korea and Japan, runs through Oct. 31, 2021—expiring around the same time as the MLB-MLBPA’s union contract. This deal shows progress in U.S.-Cuba relations at a time when tensions are again running high between Cuba and the Trump administration, which has said it will undo former President Obama’s 2014 opening with the nation. It’s a laughable statement, from a joke-of-an-administration hell bent on rolling back protections for working people, building a wall at the risk of government shutdown, and treating immigrants fleeing oppression—oppression created by “us”—as cattle to be rounded up and caged. Ignoring the White House’s response, players are hopeful as to what this agreement will do. 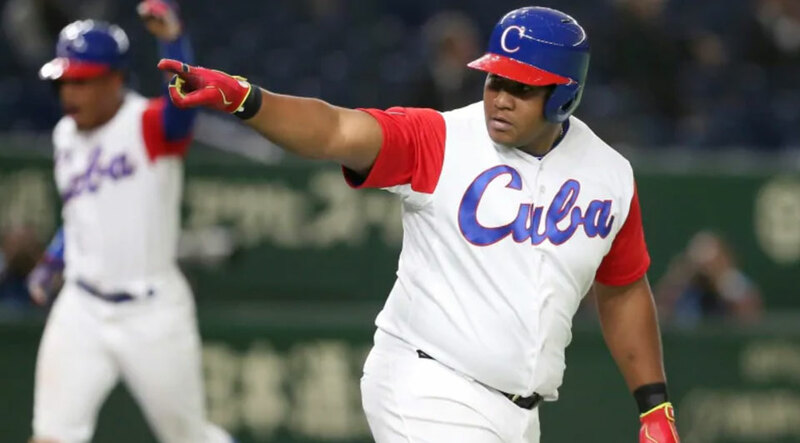 “Words cannot fully express my heartfelt joy and excitement in learning that Rob Manfred and Tony Clark have reached an agreement with the Cuban Baseball Federation. Knowing that the next generation of Cuban baseball players will not endure the unimaginable fate of past Cuban players is the realization of an impossible dream for all of us,” said Chicago White Sox first baseman Jose Abreu. 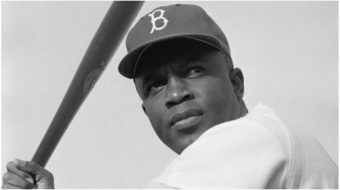 For decades Cuban ballplayers with dreams of playing in the Major League were subject to exploitation, human trafficking, and perilous journeys on their way to the big leagues. It was a calculated risk, with a less than guaranteed payoff. Leaving Cuba meant leaving home for good, being labeled a traitor, knowing the stigma it would leave behind for loved ones they’d never see again. Many well-known MLB stars of today—Yoenis Cespedes of the Mets, Aroldis Chapman of the Yankees, and Yasiel Puig of the Los Angeles Dodgers—followed that path, like Abreu. 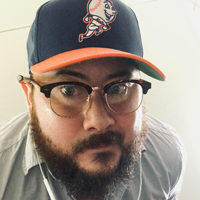 It’s the same one that players like Rene Arocha and former New York Met Rey Ordonez, who jumped over a wall to leave the Cuban national team during an international competition in 1993, were forced to choose. 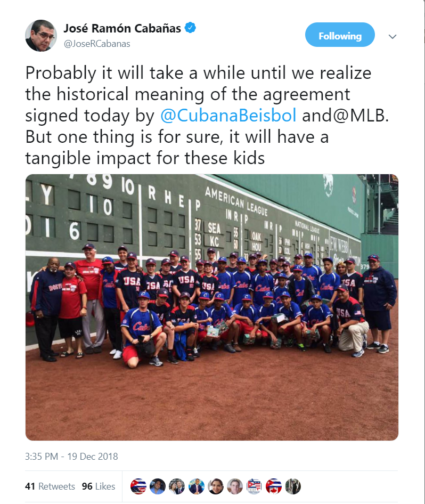 Under the agreement, only Cuban players who have a playing contract with the Cuban Baseball Federation (FCB) are covered, but any Cuban player not under FCB contract is eligible to sign with any MLB Club to the same extent as other unsigned international amateurs. Players will be able to sign with big-league teams without leaving Cuba. And the fee paid by the signing team will be covered by the same rules as in MLB’s other posting systems: 20 percent of the first $25 million of a major league contract, 17.5 percent of the next $25 million and 15 percent of any amount over $50 million. There will be a supplemental fee of 15 percent of any earned bonuses, salary escalators, and exercised options. “It’s a very important day for us. I think baseball and the players are the great architects of this achievement. It didn’t come in time for those of my generation, but we did our bit,” said Omar Linares, former third baseman for Cuba’s national team, in Granma, the Communist Party of Cuba’s newspaper. “The agreement, signed after three years of negotiation, ensures stable and non-politicized relations of cooperation,” FCB said. No details about any economic aspects of the accord were made public, according to the Havana Times. A historic moment indeed, yet one which finds this sportswriter left with a healthy dose of skepticism. Let’s hope Clark is right in this case, despite our nation’s penchant of replacing one form of exploitation for another sugar-coated version. And I look forward to seeing how this plays out during contract negotiations in 2021.